One of the major annual events for conservatives is the Conservative Political Action Conference whose theme this year is “America’s Future: The Next Generation of Conservatives.” The conference meets in the Washington area annually, and this year’s event, which begins today, comes at a time when Republican Party sentiment is to make the GOP more conservative. In a post-election survey conducted Nov. 8-11, 2012, 60% of Republican voters said GOP leaders should move in a more conservative direction while just 31% want to see them move in a more moderate direction. In contrast, Democrats want their party to move in a more moderate — rather than a more liberal — direction by a 55% to 35% margin. Although these views partly reflect the fact that conservatives make up a larger share of Republicans than liberals do of Democrats, this difference is evident even among the ideological wings of each party. 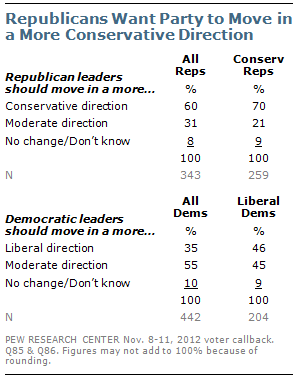 Fully 70% of conservative Republicans want the GOP to move in a more conservative direction. Liberal Democrats are divided; 46% want the party to move in a more liberal direction while 45% prefer a more moderate move by the Democratic Party. A Pew Research survey conducted in Aug. 2011 found that an increasing number of voters overall already perceived the Republican Party as very conservative. Just over one-in-five (23%) of voters regarded the GOP as very conservative compared to 18% who said so in June 2010. The percentages of those who saw the Democrats as liberal or moderate remained the same, at 32% and 26% respectively.